Out with the dirt and gone with the pet hair! We’re working our way down the rankings of the 5 best vacuums for stairs. The steady pursuit of pristine and clean stairways can be daunting. This angled cleaning application features more tight corners than almost any other spot in the house. It’s possible to fight through the clearing of the lofty situation with creative combinations of awkwardly positioned upright vacuums and hand brooms. But a vacuum that’s built for the job can cut cleaning times in half. It can also save muscle strains on the back. Many upright and canister vacuums can do a phenomenal job of eliminating dirt and dust in most applications. However, the staircase scenario really requires a special kind of tool. It needs to be designed for the daunting dirt removal dilemma. There are a few key variables that can make or break a stair suctioning situation. A handle needs to either be very long or extremely short. That will help eliminate awkward angles that make it nearly impossible to effectively cover every inch of incline. Vacuum stability also goes a long way. Most traditional vacuums have a tendency to tip over. They can be quite bulky to handle when heading up a flight of stairs. Mobility is probably the most important feature in a vacuum designed for stair cleaning applications. Hand vacuums and versatile convertible, or 2-in-1, vacs tend to offer this key function. Even backpack vacuums can bring the added range of motion. That will help you to easily overcome all of the nooks and crannies hiding and harboring particles on the stairs. When considering the best vacuum for stairs, scenarios and surfaces need to be considered. This tool is usually added as a secondary vacuum. So there’s no better reason to really zone in on the features and benefits that each product provides. Determining which vacuum is best for the job flips from the standard, multi-functional variables that are usually sought in a traditional vacuum to some specific, targeted details that will maximize the vac’s effectiveness in the application. To help navigate through the broad spectrum of secondary vacuums, there are some key questions to consider. What types of floor surface types will you be cleaning? How much versatility is needed? Floor surface is an important variable to consider when scanning the best stair vacuum options. Carpeted stairs will require beater bar or brush roller attachments to dive into the depths of the carpet fibers and extract embedded hair and debris. These sometimes motorized brushes can assist in maximizing suction. They create almost a magnet effect on much, if not all, of the particles within. Hard surfaces like hardwood, tile and cement will require a less substantial suction setup. In hard floor applications, a little bit of airspace can help draw dirt and debris into the vacuum. Many vacuums designed for stairs include attachments and settings to cover all of the bases here. So it’s just a matter of adjusting or swapping a tool to jump between the various surfaces. Others are designed to most effectively clean one type of floor surface (usually carpet). They may be designed to clean a specific kind of debris (usually pet hair). These niche vacs can be extremely successful at cleaning the applications for which they are built. However, they won’t offer much versatility in other cleaning scenarios. It’s important to prioritize the versatility that you want when deciding on the best stair vacuum options. If only stair surface cleaning is the intended use of this secondary suction device, it’s relatively easy to zone in a simple and cost-effective system that can handle the task. Prices tend to increase as features and functions are incorporated. If the vac will need to fill in for other cleaning jobs around the house, certain tools and attachments should also be considered. Some of these can still be utilized to help eliminate the other strains of stair cleaning and all areas associated with them. Retractable wands and adjustable hoses can come in handy when working up and down the staircase. However, they can also reach to the greater ceiling heights that tend come with the changing elevation. Small crevice tools and dusting brushes can help get into the tight spaces between railings. Super mobile vacuums like backpack and cordless hand vac styles can really take the edge off of a stair cleaning campaign. The lack of bulk, power cords, and weight makes it easy to move up and down the steps. You can do so while nabbing all of the pet hair tufts and other ground-in grime. Both battery-powered and corded vacuums have their pros and their cons. The best option between the two power sources really comes down to how the vacuum is intended to be used. Cordless vacuums can really unleash the freedom to access all points throughout the house. However, it’s a feature that’s especially important on a tedious trek up a staircase. There is a finite amount of time to enjoy this no-strings-attached scenario. Eventually, (and usually much sooner than desired) the vac must be returned to its charging station before it can return to the job. If the vacuum will typically only be used as a stair cleaner extraordinaire, it should easily be able to make it through a whole cleaning session without needing to re-juice. A cord can be constraining, especially on a staircase. Some applications may require an extension cord to enable the user to reach the highest (or lowest) levels without battling cord placement and restriction. The obvious benefit to this power source is that cleaning times can be unlimited. There are some specific variables to consider when zoning in on the best vacuums for stairs. Some of these features are similar to those weighed when selecting a traditional vacuum. However, some of the priorities shift in this secondary vacuum scenario. Versatility is usually a heavily important piece of the puzzle. However, this ranking list is all about the stairs. So the vacs that made it to the tippy top are the ones designed primarily for stairs and similar applications. There are a few vacs out there that can pull double duty. They tackle a variety of household (and even commercial grade) cleaning applications. For consumers looking for some major upgrades and a multitude of uses beyond the stair sucking situation, these vacs can deliver. Mobility is probably the most important feature of a good stair vacuum. This versatility can come in a combination of ways. Backpack vacuums can be of utmost convenience when it comes to climbing stairs while cleaning, containing most of the vac’s weight and bulk in a user-friendly and ergonomic way. Most residential backpack vacs are corded, typically with an add-on extension cord, so while a user is still tethered, there’s quite a bit of range of movement allotted by the vac’s design. 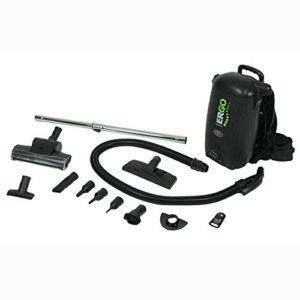 Hand vacuums are the ultimate mobile and easy-to-use suction systems. For scenarios where dirt and debris content is relatively minimal and flexibility is more important than versatility, these little suckers can quickly and effectively get the job done. Center of gravity and weight are of no issue when it comes to these featherweight vacs, and most are cordless so they job can get done without constant cord monitoring. Tools and accessories are key when it comes to stair cleaning duties. There aren’t many applications with more crevices, corners, and angles than a staircase and the right tools can make extremely light work. Handles and hoses should be adjustable, and the physical size of the tools should also be considered. Mini motorheads and compact crevice tools can really make a dent in sucky stair situations, while a full-size floor attachment or a heavy-duty, bulky hose may be too large for the task. Accessories can also unlock a bit of versatility when it comes to floor surface variations, allowing the user to switch between tools to properly extract particles depending on the floor type. These tools can be especially handy in cases of hard surface stairs with carpet runners. When it comes to ranking a vacuum’s power source, it comes down to cleaning range, whether that means a range of time that a battery will allow for cleaning or range of motion allowed by the length of a power cord. Cordless vacuums, powered by rechargeable batteries, tend to be most convenient overall, but if battery quality is inconsistent or poor, or charge times take excessively long in relation to the operation time, this can drop a vac’s placement on the rankings. However, a high-quality battery combined with a well-designed and lightweight vac is tough to beat when comparing vacuums for stairs. In a similar regard, a corded vacuum’s power cord length is key to a user’s ability to maneuver and access an area. When it comes to vacuums for stairs, there is a delicate balance to be met between cord length and bulk added by said cord length. Minimizing the bulk while maximizing the range with a corded vacuum is all about the design, and some vacs have done an impressive job of finding the right combination within this important part of the equation. 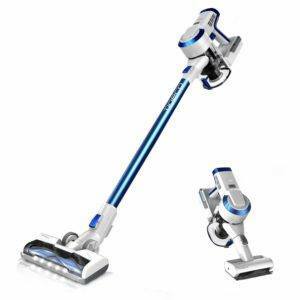 User reports and consumer reviews can provide insight into product details like a cordless vacuum’s full-charge clean time or little features and functions that aren’t necessary included in a product’s description. Recurring issues with a vac’s longevity or durability can be pinpointed, and valuable information regarding a vacuum’s performance in different applications and debris-removal situations can be pulled from these reports too. The price tag on a vacuum is one of the top variables considered when ranking the best vac for stairs. While some products with prices on the higher side of the spectrum come with some pretty flashy features, an affordable and practical product really goes a long way. Versatility comes into play with the price point too, and when the one of the best vacuums for stairs can also function equally as well in a variety of other household applications, the bigger investment seems to be justified in some situations. How can battery life be extended or maximized? What kind of maintenance is involved between the various vacuum styles? What designs or functions could negatively impact the stair cleaning process? Are certain vacs better for certain types of stair surfaces? As with all battery-powered devices, conditioning a vacuum battery upon initial setup is vital to the long-term performance of the power source. Most manufacturers will include some type of detailing of this process in the product’s owners manual, but it’s typically pretty simple to do. An average battery conditioning process involves allowing the battery to fully charge prior to first use and then letting it completely run out of power before returning it to recharge. Repeating this cycle a few times should set the battery on a path of full and successful charging sessions for the long haul. Another way to extend cleaning times with a cordless vacuum is by purchasing an additional battery (or two, depending on how much back up you think you need). Some of the vacs even allow for their batteries to be removed from the vacuum to be charged separately so that a second battery can be incorporated to extend cleaning times. This means never having to cut short a quality cordless crumb quarantine time, which sounds pretty amazing. Maintenance will vary a bit between the two main styles of vacs, bagless and bagged. Bagged vacuums will require the continuous purchase of replacement bags for the duration of the vacuum’s lifespan. However, this is usually the extent of the maintenance you will need to do. Filters are almost always within the bag. They don’t require any extra attention since each time you add a new bag, it replaces them. Bagless vacuums can be quite a bit more dependent on maintenance than a bagged system. You will need to wash and/or replace filters as needed. You will also need to empty the dirt collection bins when they get full. Most bagless systems have attempted to make both the filter and dirt bin cleaning process as simple as possible, but some have achieved success on this front more than others. Dirty filters and jam-packed dirt bins can dramatically impact a bagless vacuum’s suction capabilities. So there’s really no way to get around the necessary maintenance if you desire a functional suction system. Accessories and tools will need routine cleanings from time to time. Beater bars and roller brushes will need some attention, especially in applications where pet hair flies. Rinse and air dry dusting brushes occasionally, too. There are some vacuum designs and features that, in the specific case of dirty, dusty stairs, can actually impede mobility and efficient debris extraction. The vac’s weight displacement is key. When traversing stairs with a suction system the last thing you want is a tipsy, dirt-filled upright or canister vac taking a tumble down the stairs. And while long and sturdy hoses are highly sought after in the traditional vacuum realm, the close-quartered stair-cleaning conditions don’t work well with these bulky and lengthy tunnels of whirling wind power. Power cords are a serious consideration when it comes to ascending to higher elevations while extracting disgusting debris. A lengthy cord can make a huge difference when it comes to navigating the narrow and sometimes winding passages of a staircase. However, a cord that’s too long can add a substantial amount of weight to the vacuum when not fully extended. Incorporating an extension cord into the mix may not be the worst thing, and can add some flexibility to the job, though it will require some added expenses and storage space. Knowing the application in which a vac will be used is key to determining the best one for the job. Hard surfaced stairs with carpet runners will benefit from a vac with both motorized brush head attachments and crevice tools. Adjustable suction settings will add to the versatility of the vac and its abilities to adapt to the different surfaces. Beater bars and brush attachments are best for plush carpet fibers and can really dig in deep to nab all that hides beneath the surface. For applications where there are open railings and raised ceilings, a vac with adjustable extension wands and small accessory tools can really help tackle the full scope of the staircase and its surroundings. As always, a buyer’s budget and primary needs factor heavily into which vac is the best value in a specific situation. The vacuums that have made the list cover a range of designs and price points and all offer superior abilities to ease the job of vacuuming stairs. Battery life, cord length, price points, suction settings, and mobility have all been large factors in determining the best vacuum for stairs, along with some other unique features that can really lighten the load when hiking the stairs in pursuit of a particle-free pathway. The Shark Rocket Corded Ultra-Light Hand Vacuum is a powerful and portable vacuum system, great for conquering a variety of tasks. It comes with an arsenal of tools. You can use it for quick pick up jobs or more complex extraction situations. The dirt cup is a reasonable size, considering the compact dimensions of the vac. The vac’s bagless design means there’s no need to purchase replacement bags. You can easily empty the dirt cup with minimal interaction with the dirt and debris. This Shark vacuum is lightweight and easy to carry and hold during operation. This means simple step sucking and the vac can successfully remove debris from both hard and carpeted floor surfaces so you can use it in a variety of applications. While the vacuum is vicious against pet hair and dander embedded in the carpet fibers of a steep staircase, it all packs a powerful punch on eliminating dust and debris from furniture and curtains. The price point of the vac makes it an affordable option. When you combine the affordable price with the solid collection of accessories and tools included with the vac, the Shark Rocket Ultra-Light Hand Vac can be a lucrative addition to any cleaning collection. Users report great successes on plush carpet with the use of the motorized brush head. The bristles grasp grime and grit with power and ease, though the rollers and bristles within the brush can be a bit tedious to clean after a rewarding rendezvous with hoards of buried hair. Some reviewers report that the vacuum can be a little bit cumbersome to store and a few mention that a retractable cord feature would be a welcome upgrade in future versions of the vac. A couple users also note that the cord could be a bit longer and find themselves having to stop mid-suction to adjust and relocate the cord. Dumping the dirt bin is a pretty seamless process according to a few users. Filters are separate from the dirt bin, which means that a user doesn’t need to dismantle or remove the filter during the simple act of eliminating dirt from the collection container. The mini motorized brush destroys pet hair and dander. This compact motorhead allows the suction to strategically target particles that are in otherwise unreachable areas. The vac also comes with a convenient crevice tool and a dusting brush. That way, you can reach tough-to-reach stair components with relative ease. As referenced in some consumer reviews, the Shark Rocket Ultra-Light power cord can be a bit short for most standard applications. The addition of an extension cord may help to take the pressure off of the situation and allow for more mobility during the vacuuming session. In order to keep suction levels at optimal extraction capacities, it’s important to keep up on maintenance. Once a month, you should rinse and air dry the filters. Empty the dirt cup when full. The suction quality can start to take a serious dive if you neglect these components. The Bissell CleanView Deluxe Corded Hand Vacuum is a lightweight and convenient, compact vac that seems to be most effective at removing pet hair from carpeted surfaces. In this specific application, there really isn’t a more affordable and portable vacuum for carpeted stairs. A reasonably lengthy power cord allows you to easily operate the Bissell CleanView up and down stairs. You won’t need to relocate it in most applications. The multi-stage filtration system is simple but effective and the see-through dirt bin allows clear visibility to the bin’s fill levels. The bin is reasonably easy to dump. However, you may come into some contact with the contained contaminants during the dumping process. This handy vac is a canister/shop vac/handheld hybrid vac of sorts and comes with multiple attachments that enable it to span a relatively broad spectrum of tasks. 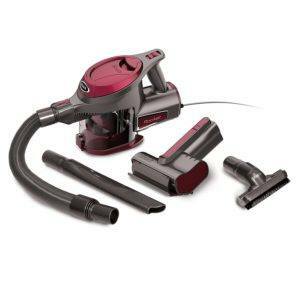 The Bissell CleanView is not only a supreme staircase suction system but it can easily become a trusty vehicle vacuum. The super compact design of the Bissell CleanView means you can easily transport and store it. It has a footprint of less than one square foot. Consumers rave at the Bissell CleanView vac’s ability to extract stubborn pet hair from their carpeted stairs. They also report that the vac is extremely effective in vehicle upholstery applications and is easy to move from job to job. The handle grip can cause a bit of fatigue over the course of a cleaning session. According to some users, the on/off switch location can be tedious at first. Various consumers note that the vac seems to be exceptionally well-built for the price and has held up to some pretty dirty jobs without missing a beat. The filters can be a weak point and tend to require some attention in order to keep them operating at prime suction levels. The two-foot flexible hose combined with the wide-mouth attachment can do some serious damage to deeply embedded debris and the crevice tool can help reach the corners and crevices. The Bissell CleanView Deluxe may not be as versatile as other hand vacs. You probably should not consider it for other jobs around the house. For applications where there is carpet and there is hair, though, this vac can handle it. Rubber bristles on the front of the suction head help grab pet hair and debris of similar consistency from the carpet fibers with precision and minimal effort from the user. 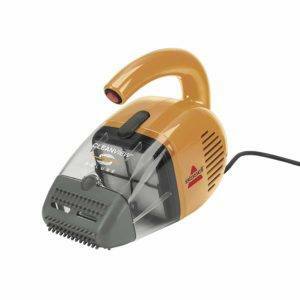 The vac seems to be durable and can handle somewhat heavy-duty tasks specific to its skillset. The Tineco A10 Hero Cordless Stick Vacuum Cleaner is an extremely versatile vacuum, capable of handling both standard vacuum scenarios like floors along with targeted jobs like stairs and ceilings. The A10 Hero has the ability to function as a full-sized but lightweight stick vacuum but can also transform to a tenacious hand vac capable of tackling a broad spectrum of tasks. The price point within the realm of secondary hand vacs is high. However, this vacuum is affordable when it comes to other vacs in its class. The four-stage HEPA filtration system can capture and hold some of the tiniest particles and keep them contained in the onboard dirt bin. The micro-mesh system can nab pollen, dander, and even tobacco smoke, cleaning the air while it cleans the stairs. Adjustable suction settings allow you to utilize the vac on different flooring surfaces. They make it a versatile villain to a variety of inconspicuous invaders seeking cover on both hard and carpeted materials. Cordless operation makes the Tineco A10 Hero a portable and super mobile system that allows users to effortlessly wreak havoc on dust accumulations on the stairs. The detachable battery means there can be multiple power sources in play and just because the juice runs out doesn’t mean the suction fun has to end. Reviewers report that the A10 Hero’s suction is powerful and it can extract lots of different types of debris from most surfaces. The floor motorhead’s LED lights are a common favorite feature among Hero users. The lights seem to reflect on elusive debris that people would usually miss. Many users recommend purchasing a secondary battery. Reports say that the vac does such a great job at debris removal that it can be a bit devastating to cut things short when the battery runs out. The vacuum seems to be able to handle pet hair, dander, dust, and other tricky tiny particles, though people report the dust bit is a bit small and they need to empty it quite often. The A10 Hero features a power lock switch which allows users to lock the power switch in position for continuous operation. This design can literally take the pressure off during the suction session. The vac’s turbo suction setting can provide some serious assistance, especially in high-pile carpet settings. While intense and convenient, the mode also dramatically decreases battery charge and can drop a 20-minute cleaning session down to a few-minute super extraction situation. When it comes time to dump debris you captured, the dust bin minimizes contact with dirt. However, you may need to have some interaction with it to properly clear the bin. Storing the A10 Hero can be a bit tedious, though the stick does stand alone. The Atrix VACBP1 HEPA Backpack Vac is a crafty and convenient suction setup. This super mobile vac style is specifically for commercial applications, allowing users to quickly and quietly access all reaches of a cleaning application. With adjustable straps and a relatively lightweight canister, the Atrix VACBP1 is a functional and very versatile vacuum variation. The bagged dirt collection system with four-stage HEPA filtration can contain some of the tiniest debris. There is nearly zero potential for re-introduction into the environment. The ergonomically-friendly design enables users with lifting restrictions and other mobility issues to easily operate the vac with minimal physical impacts. You can convert the hose locations to accommodate both left-or right-handed operators. A toolbox worth of accessories comes with the Atrix VACBP1, making it not only an ultra-mobile suction system, but a multi-purpose solution for a gamut of grimy situations. This vac even converts to a blower with various nozzle sizes to best target specific settings. While it may seem a bit excessive to purchase such a unique vac for the very specific stairway cleaning application, there really isn’t a design out there that is more mobile and easy to maneuver than a backpack vacuum. Reviewers report (gasp) enjoying the stair cleaning process when utilizing the Atrix VACBP1. There even seems to be a hint of occasional spousal discord when it comes to who gets to flit up and down the stairs wielding a dirt-destroying wand with a lightweight storage pack strapped to their back. People report that the adjustable extension wand is a handy helper when it comes to reaching the ceilings, corners, and crevices that surround the staircase setting. This tool is also helpful for accessing the dirty depths of the behind-the-fridge region. Reviewers report that suction is powerful and in some cases it can be almost too powerful. You will need to monitor area rugs during the cleaning process, as some people report that the Atrix VACBP1 can chomp them. The harness straps aren’t as adjustable as some users would prefer and quite a few owners note that the harness could use some additional mid-section supports to help brace the vacuum. The Atrix VACBP1 Backpack Vacuum includes a crevice tool, a turbo brush, and a floor brush. You can use these accessories in a variety of suction scenarios. The extension wand adds an extra level of functionality. And of course there’s a belt holster on the vac’s harness for onboard tool access. The Atrix VACBP1 uses a very sizable bag to contain all of the debris it captures during a vacuuming session. Replacement bags are affordable and available for purchase in small packs or in bulk. You will need an extension cord that you supply to operate it. Due to the commercial-grade nature of the Atrix VACBP1, this power source set up allows users to be flexible with their power range needs and utilize the length of cord that best suits their needs. The Shark Pet-Perfect II Cordless Hand Vacuum is a budget-friendly hand vac that meets the needs of most small-scale, quick pick up situations. The super portable vac is lightweight and comes with minimal but function accessory tools. You can use the Pet-Perfect II on carpet and hard floor surfaces. It comes with a motorized brush roll attachment that extracts pet hair and deeply-embedded debris from carpeted stairs. The vac comes with a wall-mountable docking and charging station. An LED charge light indicator signals battery charge status so users know when the Pet-Perfect II is ready for action. The bagless dirt collection design is simple and the filter is easy to rinse and reuse. The dirt cup is small but manageable when used as a stair suction device. The price point of this powerful vac, combined with its compact design has landed it on our rankings list, though the multitude of reports of battery issues have dropped the vac within the ranks by a few spots. Users claim the Shark Pet-Perfect II does a spectacular job of grabbing pet hair from carpeted surfaces with the use of the mini motorized brush roll. People report that this crevice tool is effective and can easily navigate along narrow surfaces. Shark Pet-Perfect II owners report using the feather-light vacuum in a variety of applications, from floor touch ups to upholstery sweeps and from stair treads to the interiors of vehicles. Various users report owning multiples of the same vac because they enjoy the cleaning mobility that it can provide. There are lots of reports of users having some major issues with the vac’s battery holding a charge after the first few months of use. This seems to be due to the charging station possibly continuing to send power to the vac after you fully charge the battery. Per some users’ reports, the vac may need extra (and inconvenient) attention during the charging process. You should probably remove it from power once you fully charge the battery. The mini motorized brush roll is extremely efficient at extracting debris from carpet fibers. The brush is easy to clean and you should maintain it as it needs it. 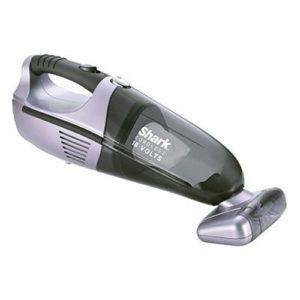 The Shark Pet-Perfect II may not be the best vac for bigger jobs, but when used in the capacity they designed it for, this compact vac can be a cost-effective solution for various small jobs around the house. During the dirt bin dumping process, you will need to make some contact with the filter. This can be a bit messy and may require some hands-on contact to fully evacuate all debris from the bin. A full battery charge should provide about 20-30 minutes of operation, though the motorized power brush attachment will cut operation times down to about 10-15 minutes of constant usage.